Do you like Bump Bump Bump? Share it with your friends. Bump Bump Bump is a very catchy logic game in which you have prepared for yourself a total of eighteen different levels of difficulty, each of which has three levels. 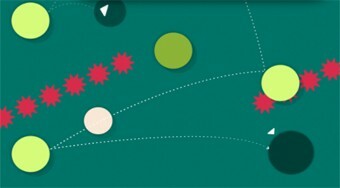 In each round, your task will be to get three white balls to the marked goal. Place flexible balls on the board to reflect the falling white balls and get to the finish.